I used to do a lot of calligraphy type stuff like this. This one is quote by Andre Gide. My husband is holding it up for me. saw emptiness, nothing at all? 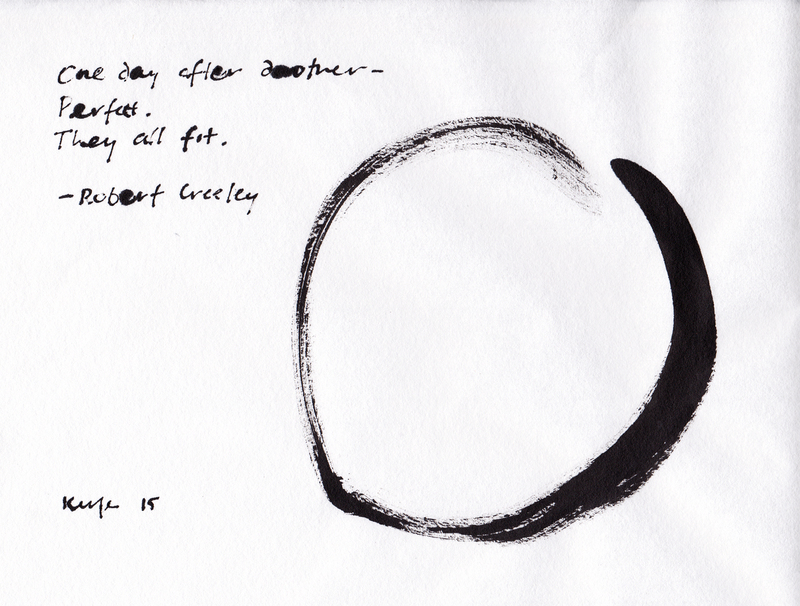 Enso is a calligraphic circle made with one stroke. This symbolic sphere encompasses everything, and also nothing. I am glad Kerfe saves everything and posted the poetry month bookmark from her daughter’s school. At first I thought Chang Liu was a poet of some Chinese dynasty: such eloquence! Then I realized he or she was a third grader at the school. I liked the poem so much I did a little version in a way I thought a third grader would do. There is a little sun coming out right now (7:30 AM) and it looks like a nice day. “There is hope in honest error, none in the icy perfection of the mere stylist”. Charles Mackintosh, Glasgow. I have always done calligraphy and love handwriting. Interestingly, Kerfe has knowledge of handwriting analysis, one of her many talents. This quote used to hang in the old Museum of Modern Art in Mackintosh’s distinctive architectural writing. I will post an example of his graphic style in a future post. His words ring true to me because I make a lot of mistakes while drawing and painting but I know there is hope in them. As an art teacher once said, there are a lot of happy accidents. Today’s NY Times magazine section deals with aging, and when I read this quote I was immediately inspired to do it in brush calligraphy (lacking a calligraphy pen at the moment). As a woman growing older, I don’t really think about my age; I don’t think Kerfe does either. We both are the same people we were back in the 70’s when we met. Although I am not jumping for joy each and every day, I see the world as a mostly wonderful place despite the truly horrible things going on. Doing this blog and reading the blogs we follow inspires me and every day I learn something new–art, poetry, cooking, books…it is all here. Every person I meet has something to teach, especially the older ones, but all of them. (All technology skills I have are thanks to my darling daughter). So despite the length of this quote, I am posting it with all respect to T.H White. I may have to reread this book which I read so many years ago. All hail the elders!